‘In the beginning, during the late 1950s, it was just an innocent idea in Eugene Garfield’s head. A Philadelphia researcher who described himself as a “documentation consultant” , Mr. Garfield spent his free time thinking about scientific literature and how to mine information from it. He eventually dreamed up something he called an “impact factor”, essentially a grading system for journals, that could help him pick out the most important publications from the ranks of lesser titles. To identify which journals mattered most to scientists, he proposed tallying up the number of citations an average article in each journal received. This accounting method sounds harmless enough. Outside academe, few people have even heard of it. Mr. Garfield, though, now compares his brainchild to nuclear energy: a force that can help society but can unleash mayhem when it is misused. Read this article in the Chronicle for Higher Education. Related call for paper in EspacesTemps.net: Questioning scientific evaluation. 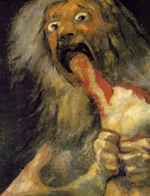 Image: Francisco Goya, Saturn (detail). From: Mark Harden’s Artchive. Le cerveau chimique et les sciences sociales.